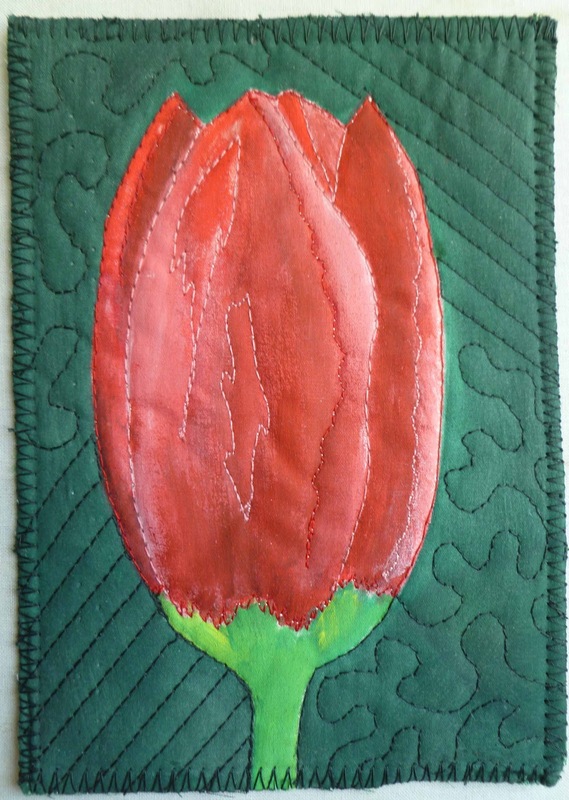 I was recently gifted with a beautiful quilt post card from Ineke. She has made a number of these beautiful cards and sent them to her followers. Thank you Ineke. 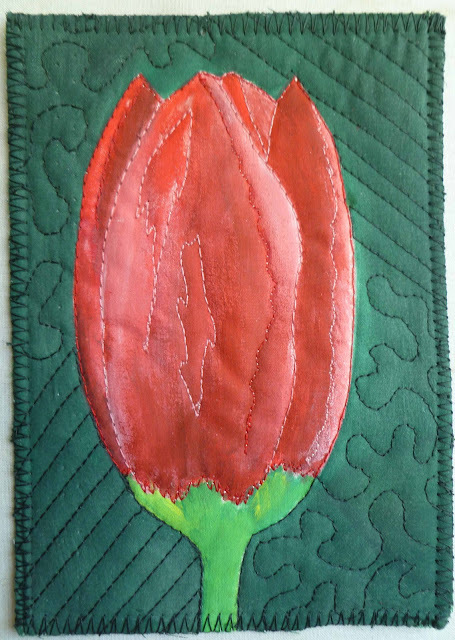 Mine is a iconic tulip so apropos from a artist from the Netherlands. It is hand painted and free motion quilted. Over the past year or so I have received other cards from quilters. Going back in time, I receieved this one from Nienke. It accompanied a book she sent and is an actual card with a mini-quilt on the front. It reminds me of a short party dress. 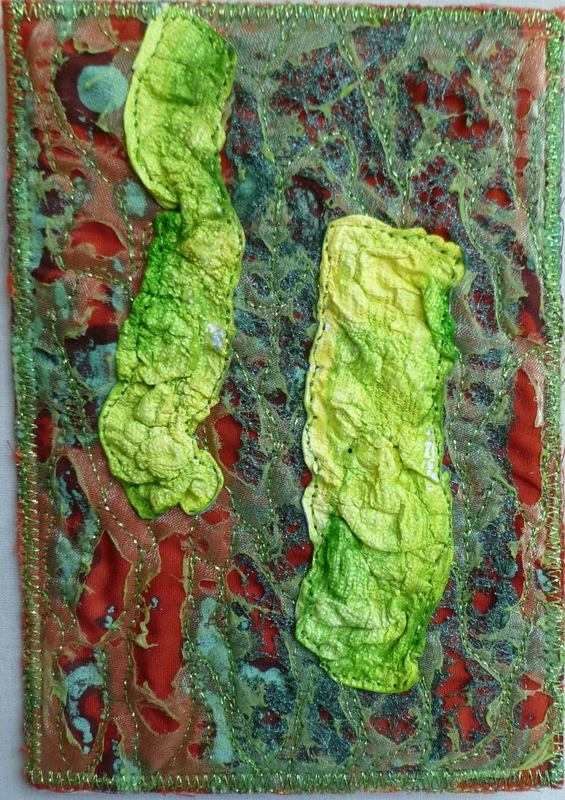 A piece of painted and heat shrunk Tyvek sits atop a small piece of free motion quilted fabic all of which is attached to a paper card. The next is from Suus who lives up to her name (Sweet). It is multi-layered with fabric, organza which was free motion stitched then burned with a heat gun and painted Tyvek was added. It is complementary colors with a zig-zag stitch edge in metallic thread. Last but not least is a really cute card from Dotti. It has a fabric background with masses of salvaged threads, a button, lace, a photo on paper of Annie Oakley and at the bottom a small swatch which reads, "The only direction I'm aware of is West!" Dotti, by the way, lives out West!! Thank you one and all for these lovely cards. They are all out on display in my studio. 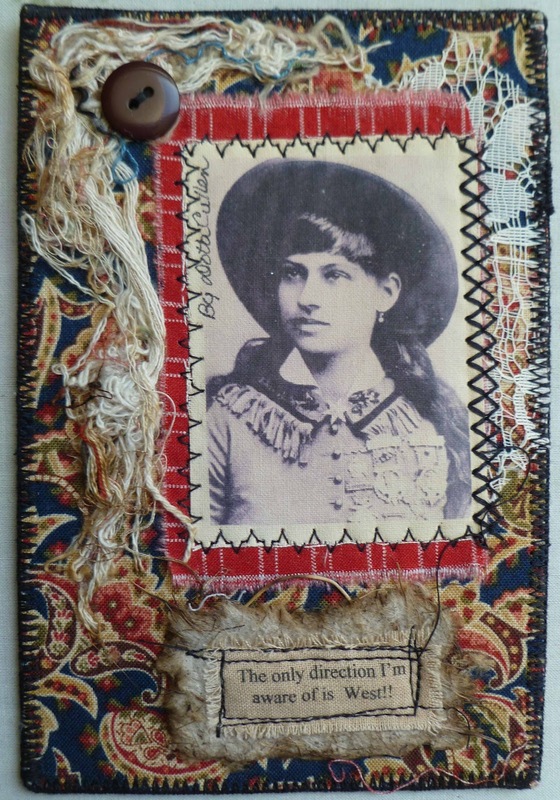 Ineke is really a celebration of he with all these beautiful cards. Totally great that they will send you a tulip from Holland. I have to laugh on the map of Nienke, because I made. The book also because you had bought from me?! That Nienke had arranged. 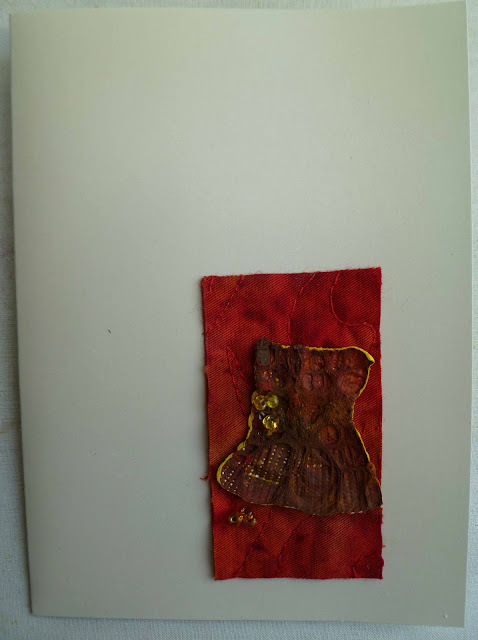 The surface of the card is polyester felt and then dyed vlisofix is pasted. I feel as though I have made a new friend! Welcome to EDM. I, also, have been making fabric postcards and belong to an art quilters group. Oh how I wish that we could be closer, but I will enjoy your postings from my home in California.